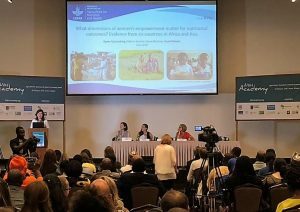 Over 300 researchers gathered in Accra, Ghana, from June 25-29 for the 2018 Agriculture, Nutrition, and Health (ANH) Academy Week. The week began with a lively learning lab – led by Erin Lentz, Jessica Heckert, Elena Martinez, and Sita Zougouri – on integrating gender into agriculture, nutrition, and health research, in which participants shared their gender research questions and debated the appropriate methods and tools to address them. During the rest of the week, many of the panels, posters, and learning labs emphasized the importance of considering gender and women’s empowerment. Presenters highlighted the challenges faced and insights drawn from measuring women’s empowerment, connecting women’s empowerment to diets and nutrition, and assessing gendered patterns in agency and empowerment. The evidence connecting agriculture and nutrition can be confusing – why are the two areas well linked in some situations but not others? Erin Lentz of the University of Texas at Austin, who chaired a panel on gender in agriculture to nutrition pathways, theorized that gender may be an important mediator in these pathways. Women’s empowerment, for example, can influence how households make decisions about income, agriculture, diets, and more. But what is empowerment and how can we measure it? Multiple presentations explored how to conceptualize and measure women’s empowerment. Amy Webb Girard of Emory University presented her team’s work modeling empowerment using data from the Demographic and Health Surveys from five countries in East Africa. Through exploratory and confirmatory factor analyses, they modeled women’s empowerment through women’s assets, intrinsic agency, and decision-making about earnings. Jessica Heckert and Elena Martinez of IFPRI and A4NH led a learning lab about the project-level Women’s Empowerment in Agriculture Index (pro-WEAI), a survey-based index for measuring women’s empowerment in agricultural development projects. Pro-WEAI is being developed using pilot data from 13 agricultural development projects in Africa and South Asia. Jessica Heckert also presented the pro-WEAI nutrition and health indicators. These indicators help agricultural development projects with nutrition-sensitive objectives to assess women’s agency related to diet and health. Indicators of women’s empowerment can also be useful in measuring other constructs. Mousumi Das of Xavier University described her work developing a multi-dimensional measure of food insecurity that incorporates related indicators of women’s empowerment. Empowered women can make decisions that might influence their families’ diets and nutrition. However, are the same aspects of empowerment important in different contexts? Agnes Quisumbing of IFPRI described her team’s analysis of associations between women’s empowerment and nutritional outcomes in Africa and South Asia. Some aspects of empowerment – such as decision-making about agriculture and rights over household assets – were associated with nutrition outcomes, but these results varied widely by country. In Amy Webb Girard’s models from East Africa, women’s empowerment was indirectly associated with child nutrition – women’s empowerment was associated with higher maternal BMI, which was associated with higher child weight-for-height z-score. Gender roles can influence how different family members spend their time and their diets, nutrition, and health. Multiple presenters delved into these complex relationships. Zean-Marie Zongo of Agribusiness Systems International described his work on the linkages between poultry, gender, and dietary diversity in Burkina Faso. Zongo and his colleagues found that gender norms influence how households purchase and distribute food. Their research suggested that empowering women to make decisions about poultry production and household income could improve household diet and nutrition. Fiorella Picchioni and her team at the University of Reading used accelerometry devices similar to Fitbits to assess seasonal patterns in energy expenditure. They found that women participated in more domestic activities and had higher levels of physical activity than men across agricultural seasons. Women faced trade-offs between domestic work and participating in economic and social activities. Pilar Useche of the University of Florida and her colleagues used choice experiments to understand how different family members in Guatemala make food choices and allocate their time. They found that men’s and women’s roles in the household influence how they access, choose, and consume food, but these patterns varied in different areas of the country. The Agriculture, Nutrition, and Health Academy is a global research network in agriculture and food systems for improved nutrition and health. Visit the ANH Academy website to learn more. Martinez E. 2017. Researchers highlight gender and equity at the ANH Academy Week.